Inspired by the major European decorative art movement, my collections of handmade decorative column clocks is second to none in terms of their design and finishing. This excellence has been achieved over a life time spent refining the collection and the meticulous care that is taken in making them. Their elegant styling and artistic gilt and paint finishes make these column wall clocks unique stylish gifts or an interesting focal point for any room. Don't take my word of it click on any of the decorative column clocks below and see if they're all I say they are. My column clocks tend to suit a specific finish but if you’d prefer a different finish then you have a choice of gilded or paint finishes. 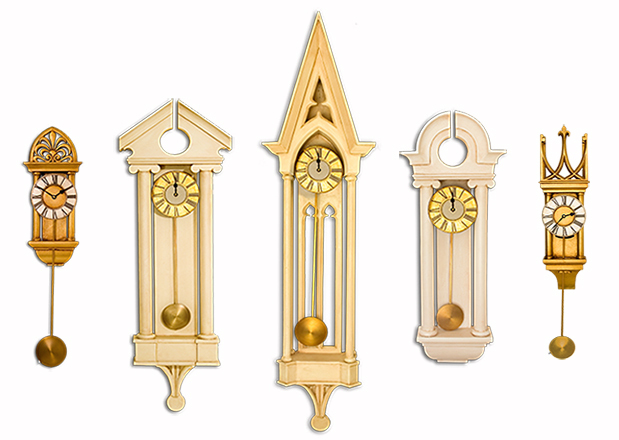 My gilded clock finishes include antiqued gold, 24 carat gold, silver and pewter. So if you are after a gold or silver column clock then I’m sure we will have the clock for you. If I don’t have the perfect decorative clock for you and you have a specific design in mind then get in touch and I can discuss making a bespoke clock to your exact specification.